WASHINGTON (4/4/16)--Fifteen thousand runners took to the streets of the nation’s capital on a cold, very windy Sunday morning, running past Washington, D.C.’s most famous monuments and helping raise more than $500,000 for Children’s Miracle Network (CMN) Hospitals. The 44th annual Credit Union Cherry Blossom Ten-Mile Run showed the runners, including a number of world-renowned elite runners and congressional staffers, firsthand the good work the credit union system does. 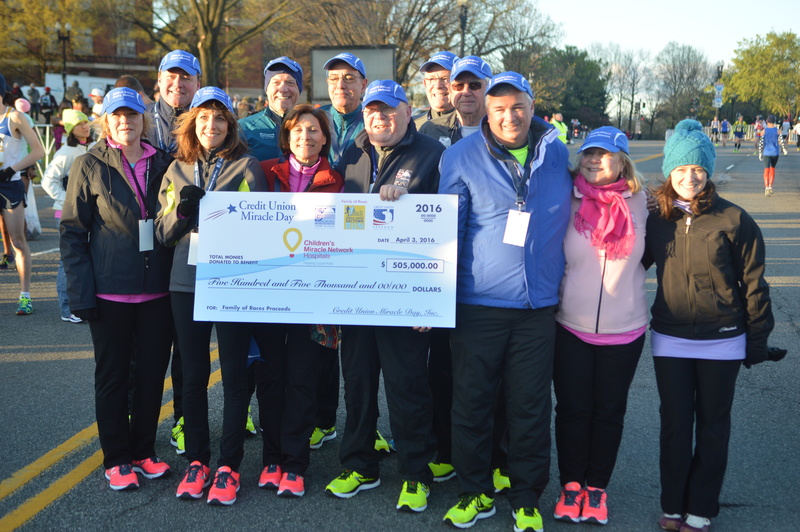 Credit Union Miracle Day, the title sponsor group of a family of races, presented a donation to CMNH Sunday at two popular races on the east and west coasts--the Cherry Blossom Run and the Credit Union SacTown Run in Sacremento, Calif.. The D.C. race featured runners and volunteers from the Credit Union National Association (CUNA) and a many other of credit union volunteers helping the event go smoothly. Temperatures were in the mid-30s and wind gusts hit 40 miles per hour during the day's events, causing a few schedule changes, but the 10-mile race went on as planned. Just prior to the race's start, CUNA board chair Rod Staatz helped present a check for $505,000 to CMN Hospitals from Credit Union Miracle Day, a collaboration of more than 100 credit unions, business partners and credit union service organizations. The funds were raised by both the Cherry Blossom Ten Mile Run, and the Credit Union SacTown Run in Sacramento, Calif.
"The Children's Miracle Network is such a tremendous organization, the care that the doctors, nurses and other healthcare providers give is unparalleled," said CUNA Chief Operating Officer Rich Meade, who cheered on the runners with Staatz at the starting line. "It's a cause credit unions and their partners are proud to support." Credit unions are among the top three contributors to CMN Hospitals, after Walmart and Costco, having donated $11.5 million in 2015 alone. This is the 15th year credit unions have sponsored the race. This year's race made history, with Sam Chelanga (48:25) becoming the first American to win the race since 1990. Kenyan Veronica Nyaruai Wanjiru was the fastest female runner at 53:11.6. Two-hundred and nine members of Congress signed on to be honorary race chairs for this year’s event. In addition, 66 teams consisting of more than 800 congressional staffers competed for the 15th year for the Capitol Hill Competition, sponsored by Congressional FCU and U.S. Senate FCU, along with CUNA and the National Association of Federal Credit Unions. At the Credit Union SacTown Run in California, it was a windless, sunny morning. The top male runner was Jordan Chipangama, the returning champion at 49:23, The top female runner was Jane Kibbii, the race’s first-ever, three-time champion, at 53:21, a course record. Other events over the course of the day included the 10-mile run and a 5K run/walk and two freedom runs for troops serving in Germany and Kuwait. For more photos of the race, see "Highlights from the 2016 CU Cherry Blossom Ten Mile Run" in today's News Now.